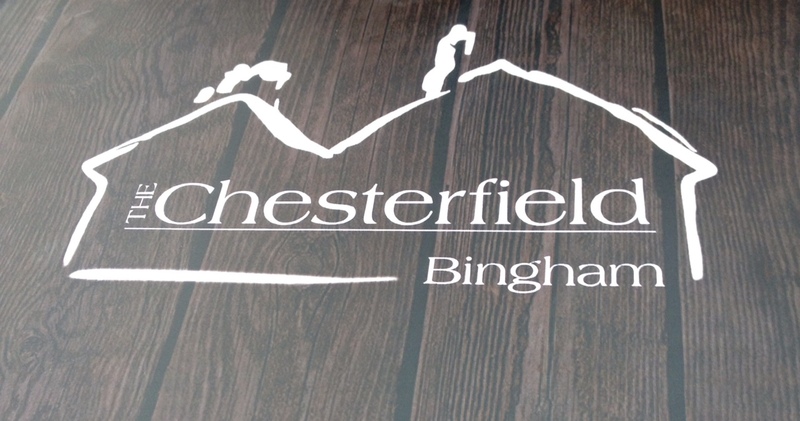 This Friday we hopped onto the bus and took a trip out to Bingham to visit The Chesterfield Pub and Kitchen. It is a pretty easy trip out from the city just 20 minutes on the Green Line from Friar Lane to Bingham. It did cost £5.50 return which we thought was a little bit steep to be honest, but it turned out to be a very worthwhile trip. I could have been sensible and just had one of the smaller offerings on the menu but once I read the menu description for the “Chesterfield Burger” I was sold. I knew it was going to be a bit of a big beast, however I was well up for the challenge. The lady taking my order asked me if I was hungry, to be honest my answer should have been ‘no not really I am just being greedy’ but instead I just said I would give it my best effort. I was of the mind that if the pub wanted to name a burger after itself then I had to make it my mission to see if that was a bold statement and a worthy representative for the pub. Yeh? I wasn’t fooling anyone, was I? 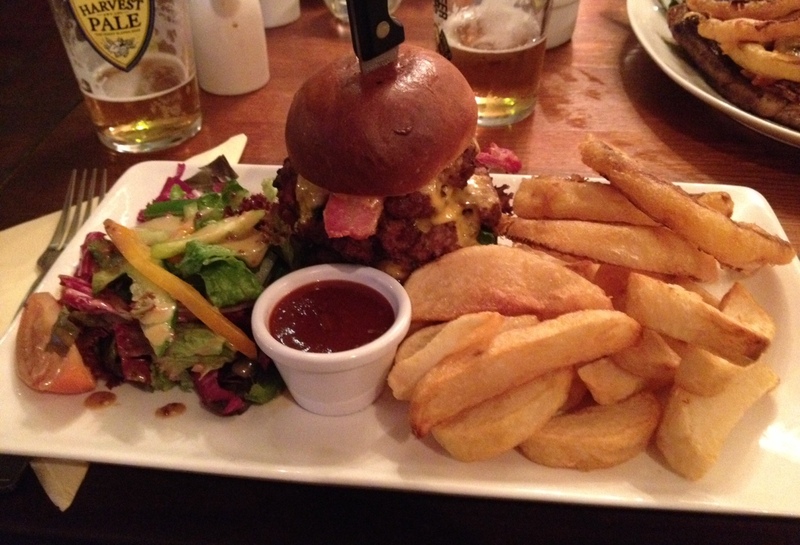 The Chesterfield Burger was a thing of beauty, was it overwhelming? well yes but no more intimidating than walking up to the most attractive woman at the bar (standing next to her, ordering two pints of Harvest Pale and then walking back to your table (with Beer!) ok epic fail but I kind of still win ). I knew I had this one covered right from the first bite. The beef patties were exceptionally well seasoned, nice and peppery with a good solid bite. The meat was a little crumbly and you could tell it had been freshly ground and formed ready for the grill. There was a plentiful covering of molten and melty cheese oozing from the bun and draping itself seductively over the top burger in the bun. There were a couple of super slices of smoked and crispy streaky bacon criss-crossing themselves over that pattie as well. They were most excellent. I do love a slice of smoked streaky, it reminds me of burgers in the States and it also adds a lot of really great smoky and salty flavour to the bite. To delve a little deeper into this beast I cut her in half to get a nice cross section photo. You can see that the meat has been cooked perfectly so that was still nice and pink. The bun on the bottom layer was also part of the party with a nice layer of some sweet perhaps lightly pickled onions and a layer of crisp lettuce. Although the star of the show (or the plate) is that stacked Chesterfield burger, I really do have to talk a little more about the other members of the plate party. There was a really fantastic side salad, a salad worth eating and a salad that I would have happily eaten on it’s own as a meal in itself. It was made up of a decent selection of crunchy salad leaves, tomato quarters, peppers and a nice sweet and tangy dressing. The barbecue sauce was quite acceptable with a light smokey and sweet back note, the chunky chips were good too, way too many to accompany a burger of this size, but lets be honest here I have already ordered way too much burger so I shouldn’t say anything. A special mention has to be given to the onion rings. They were nothing short of amazing, it is so rare to get an onion ring that is crispy and crunchy and with a light bite. The coating stayed on the onion with each bite. I think it must have been some sort of tempura style effort. I will have to check out the menu next time I come here to see if they sell these on their own (hopefully in some sort of massive bowlful. I loved my visit to the Chesterfield pub and kitchen. Should I have eaten that massive Chesterfield Burger? Well the demon on one shoulder said ‘no’, and the angel on the other said ‘yes’. That’s how my angels and demons roll. Just in case you didn’t twig! the burger was named AFTER the pub, although it is possible that you may be confused thinking that it was slightly crooked like the Chesterfield spire, or that it was named after a Chesterfield Sofa just because after eating one you really need to just slump upon one in some sort of food coma. You know what if you are all over the burgers at Annie’s Burger Shack in the city? (Who I am totally in love with) then you should hop on that bus out to the Chesterfield in Bingham as I can assure you that the burgers here are pretty good too. 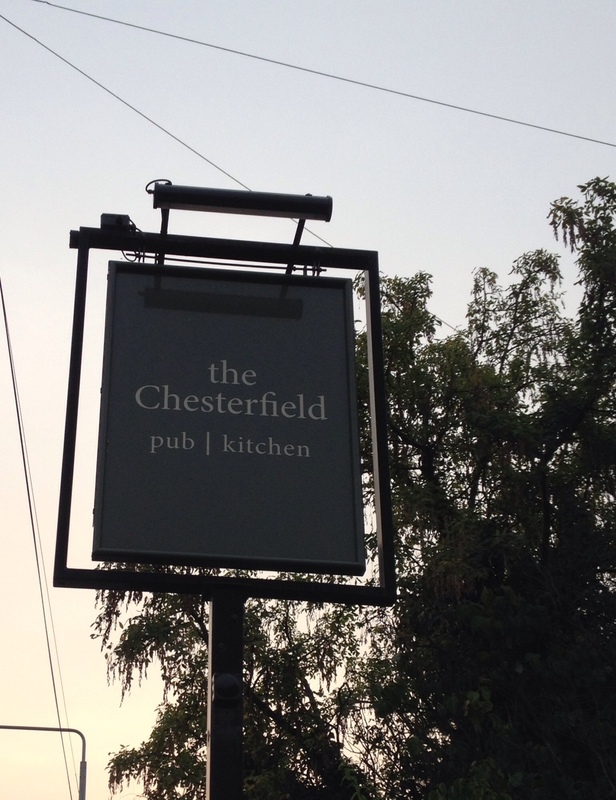 The Chesterfield Pub and Kitchen is located in Bingham Nottinghamshire at Church St, Nottingham NG13 8AL.